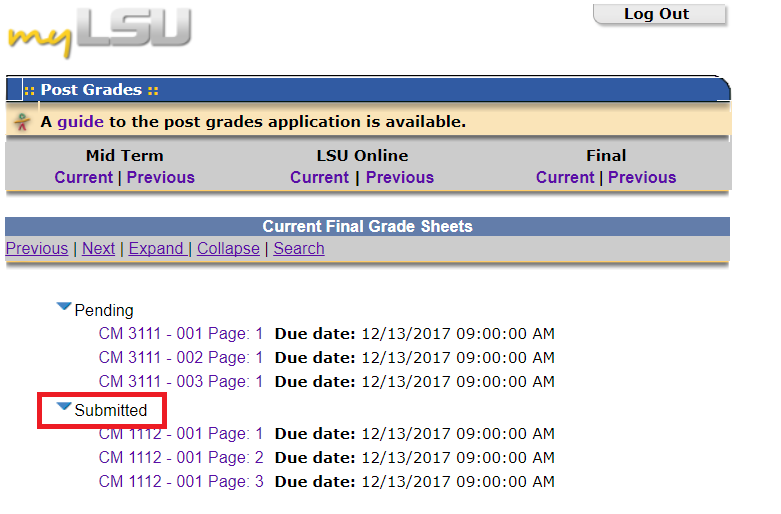 Moodle allows you to transfer your students' midterm final grades into your myLSU grade sheets. You will still need to go through the myLSU Post Grades application to submit grades to the Registrar's Office. NOTE: Only the Instructor of Record can submit the midterm and final grades for a course. Even if you are enrolled as a Primary Instructor of a Moodle course, you will not be able to post grades to PAWS if you are not listed on the Mainframe as the instructor of record. 1. Log into Moodle (moodle3.lsu.edu) and select the course. 2. 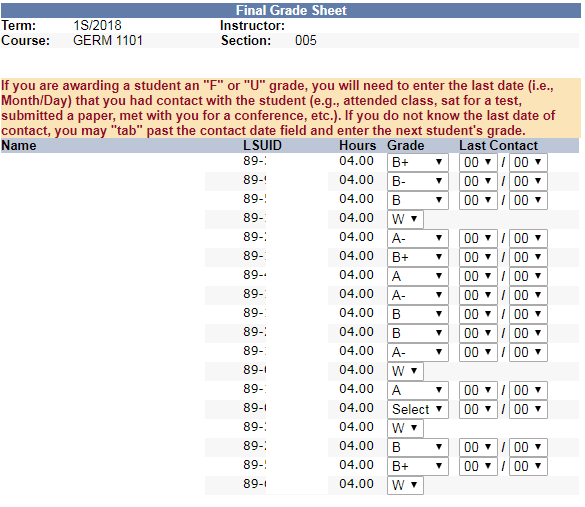 During Post Grades (MidTerms & Finals), the Post Grades Block will display and links will appear for each section, as well as a list of degree candidates. This is the time to transfer your grades from Moodle to the Mainframe grade sheets. Note: During periods when Post Grades is inactive, the block will only be visible when Editing is ON. The block will appear empty during this time. 3. Click on the section link for which you want to upload grades. A preview screen will show the course total grade for each student. This grade is expressed as a letter grade, percentage, or total points, depending on how the Course Total Grade Display Type is set in your gradebook. For information on changing the Grade Display Type for your overall course category see "Changing Grade Display Type." The default Letter Grade Scale is a 10-point scale. If you do not want to use the 10-point scale, you can create a custom scale. For directions on how to do this, see "How to Create Custom Grade Scales (Letter Grade)." All midterm and final grades will be entered on the plus/minus scale. 4. Review the grades on the preview screen and make sure they show the desired grade for each student. If there are errors in the grades, click the Return to Gradebook button. NOTE: You will only be able to transfer grades from Moodle once for each grade sheet, or section. If a check mark appears in the Post Grades block, grades have already been transferred for that section. 5. Once the students' grades are correct, click the Post [Midterm Grades/ Final Grades] button. 6. You will be redirected to myLSU Post Grades page to Verify and Submit the students' grades. Click Return to the Current View to access grade sheets. 7. Choose the arrow next to Pending, then select the appropriate class and section. 8. Review the grades on each page. If a student has withdrawn, a 'W' will be the only available grade. If a student is taking the course for Pass/Fail credit, the only options available will be 'F', 'I', and 'P'. Note: While post grades is open, instructors may make changes to and resubmit grades in the submitted area. Once post grades is closed, a grade change form must be filed with the Registrar's Office. 9. Click Submit. Each page must be submitted separately. 10. To verify the submission of grades, open the Submitted area in the myLSU Post Grades application. Submitted classes and sections will appear here. NOTE: If this process FAILS for any reason, see the article myLSU Portal: Grade Posting for an alternate method to Post Grades to the Mainframe.